Brian Colgate, pictured alongside the 907-lb. behemoth. Netted by Mike Ettinger and his crew aboard the commercial fishing vessel the Mary Beth, the short-finned Mako, accidentally caught while hunting for more traditional taco fare (white sea bass), caused quite a stir when it landed at the Santa Barbara Harbor-the shark’s toothy and terrifying grin a spectacle many won’t soon forget. Despite its delicious legacy, the booth did stir up some controversy. 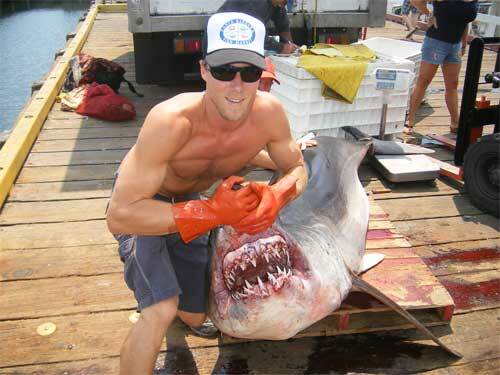 “Some people think sharks shouldn’t be fished,” said S.B. Fish Market owner and manager Brian Colgate. Others, specifically surfers, worried about potential bad karma-and perhaps some biting fallout-from eating the shark. Nevertheless, even with several other local fish options on the menu, the largest demand was for the beast and when the smoke cleared, the Mako was responsible for more than 2,000 tacos sold.